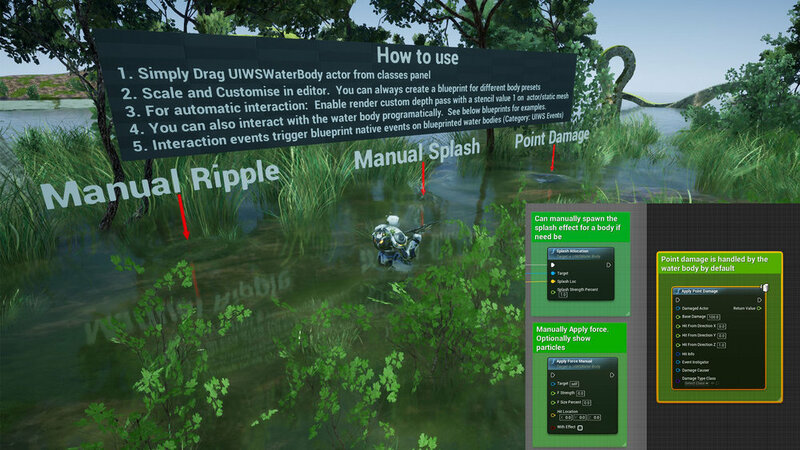 UIWS is the leading solution for dynamic interactive water bodies in Unreal Engine 4. Beautiful unified interactive fluid, interactive caustic lighting, collision and damage handling and more! The plugin is super easy to use with almost no setup required; Simply drag, drop, scale, and play! Real-time fluid interaction with caustic reflection and refraction. Automatically interacts with any object, mesh, or even particle effect. Designer friendly - easy to setup, no restriction on body scale or number. Just beautiful water for your game! Easy to customize in editor or via Blueprint. Easily add beautiful dynamic water bodies with interactive caustic reflection/refraction and foliage interaction to your game. Any size, any number, just drag and drop, UIWS handles the rest. Written in C++ for optimal performance, with blueprint functions and events for easy extensibility. UIWS can also be added to your own materials with a simple material function. Particles spawned automatically for actor collision and on unreal damage events! No setup required - just add it to your project and get splashing! UIWS has been written in native C++ and optimized to run on as wide a variety of hardware as possible. Check out the performance test video below.